Purchase orders will be announced as they are received by the company. 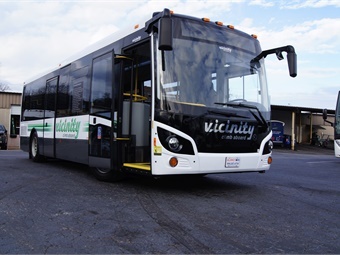 Grande West Transportation Group Inc., a Canadian manufacturer of mid-sized multi-purpose transit vehicles for sale in Canada and the U.S., received a new contract to purchase Buy America Vicinity buses by a group of Mississippi-based transit authorities. Grande West, along with U.S. distributor Alliance Bus Group (ABG), was the winning bid for a five-year contract for 30-foot heavy-duty low-floor buses. The order is for up to 63 Vicinity buses over the term of the contract. The City of Oxford, Miss., is the Executive Agent on behalf of a group of agencies listed for the procurement of the heavy-duty transit buses, under a management contract with RATP Dev USA. Each participating agency has submitted their purchase forecast for the term of this contract.